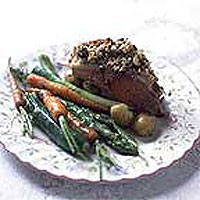 To prepare the coating, mix the breadcrumbs, pine nuts, anchovies and herbs. Season. Place the lamb in a roasting tin, ribs down, and press the crumb coating all over the layer of fat. Roast for about 25 minutes (for slightly rare meat), then leave to rest for 5-10 minutes before cutting into individual portions and serving. Serve with lightly cooked baby vegetables, tossed in butter and fresh mint, and new potatoes.